Our usual way of doing pork meatballs, which we call bola bola ("ball ball"), is with onions, carrots, sometimes water chestnuts, sometimes taro or yam. This is the variation that I've always eaten growing up. I especially like the ones my Godmother makes: she usually puts strips of taro in the mix so when the balls fry up, there are extra crispy bits. Calling my Godmother up for some meatballs was not an option today. So, I thought, why not do something different with ground pork? I racked my brain for some dishes we love recently, and the first thing that came to mind was Thai fried chicken. 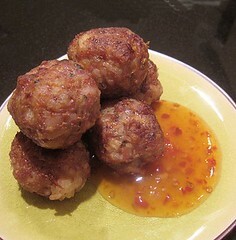 So, I thought, why not take the flavours we love and put it with some ground pork for Thai meatballs? [ts] I love the crunchy bits of water chestnuts inside! I proceeded to open up a can of water chestnuts for the meatballs. Since I specifically did not want to use up onions with ground pork that day, I needed some other filler for the meatballs. I thought of breadcrumbs but settled for a cup of cooked rice. I added some herbs: cilantro, mint and Thai basil. For the seasoning, I used fish sauce, oyster sauce, black pepper, and sesame oil. When I bit into it, I felt the meatballs could use more vibrancy, more freshness, so next time I make this, I will be doubling the amount of green herbs. A little sweetness is also in order, so a touch of brown sugar will be welcome. The recipe below reflects these changes. But, it was still a hit with the family! Combine all ingredients well. Form into balls, around 1" in diameter. In a skillet, heat oil over medium heat. Fry meatballs in batches, making sure that all surfaces are browned. Cook until done. Oh what a great take on meatballs! 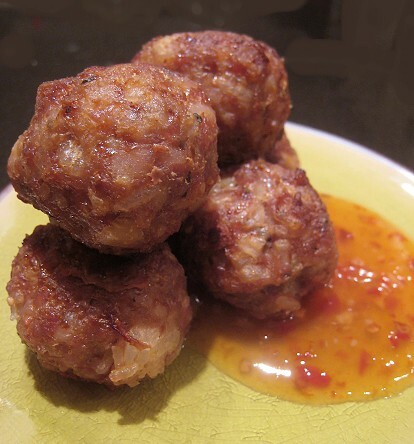 Thai meatballs -- what a great idea! I LOVE these flavors. Is that simple red chile sauce that you served them with? Oohhhh great idea! I love having crispy bits of waterchestnut in everything (I even put it in ice cream sometimes). 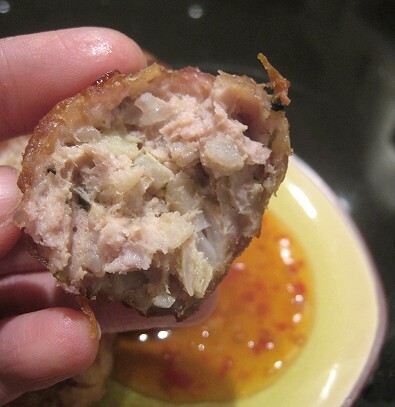 I've never tried water chestnuts in meatballs, but I bet they'd give a nice little crunch. I will have to try it. I use rice as a filler too sometimes. Thai sticky rice in particular gives a good flavor and texture. If you can get a hold of kaffir lime leaves, I highly recommend them. They will add that characteristic Thai punch of flavor. I also like to add some curry paste for heat. These meatballs sound good! I really like all of the fresh herbs in them. These look great and I wouldn't have thought to include rice in the mix! Yup, it's that same bottle everywhere, I think. It saws "Sweet chili sauce for chicken." Oh, thanks for the tips! We'll make these even more "Thai"! We've never gotten red curry paste before, but recently, I saw that our mother got some on recommendation from a friend. So we'll try that for sure.